Welcome to Milan, one of Italy’s northernmost and most populous cities. Famous for it’s art, fashion and culture, Milan is a hub of culture where old truly meets new, as seen with the focus of this post and the fashion brands and restaurants which surround it. 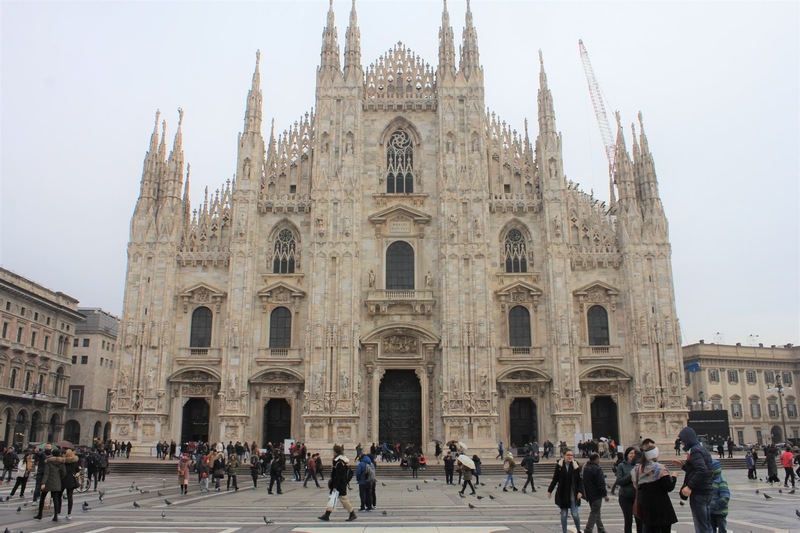 We’re kicking off this blog series with one of Milan’s most famous sights, the Duomo di Milano, otherwise known as Milan Cathedral, however more colloquially it’s the Duomo. The Duomo is the largest church in Italy and the fifth largest Christian church in the world, and it also possesses the most statues. Over 3,400 statues, 700 figures and 135 gargoyles decorate the interior and exterior of this marble masterpiece! Construction began back in 1386, making it one of the oldest churches in the world. What’s more fascinating is that it wasn’t finished completely until 1965. Nearly 600 years later. Construction and maintenance continues on to this day, with some saying it hasn’t been finished just yet. You can buy many different passes for the Duomo. We chose one (Duomo Pass B at €12) which allowed us to climb the exterior and visit the entire of the interior, including ruins of what once stood on the site. We chose to buy tickets to climb the staircases to reach the roofing rather than use the lift. In hinidsight, those stairs were extremely cramped and didn’t add anything to the overall experience really, as it’s all inside and all very dark and dingy! Shelling out the extra few euro on the lift wouldn’t go amiss. I’d recommend visiting both the interior and exterior, the difference is only of a few euros and it’s bloody beautiful. Go to the official site for full ticket information so you can make your mind up! Despite the occasional wiring and scaffolding, the exterior is largely unblemished. Despite having been stood for hundreds of years, the walls are as smooth and shiny as a Game of Thrones new build! The views of the commercial district are amazing. The architecture is so interesting and such an interesting juxtaposition to the building on which you are stood. Here we’re looking at Galleria Vittorio Emanuele II, one of the world’s oldest and most grand shopping centres! We’ll be seeing more of this in another post. A little word of advice, get your ticket from the Museum (Museo di Duomo) nearby rather than joining the absolutely massive queue at the Duomo itself. Double check the opening times however, as it isn’t open 7 days a week. I’ll leave you at the door entrance to the interior- where we’ll pick up next week! For all information on getting to the Duomo and which tickets to buy, click here. The Duomo is so central that you have nothing to worry about when it comes to finding it. I think every single person in the city, even tourists, could guide you there if you were stuck. For more travel adventures click here!